QR Codes – a matrix code or two dimensional bar code. QR Codes are big in Japan; they’re used to feed URLs to cell phones. With Chris’ help, make some QR Code Toynbee tiles and deploy them here and there (if I can get this going, I’ll be looking for tile droppers world wide). 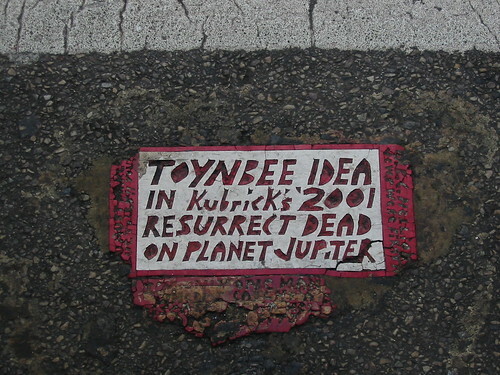 When and if someone scans the tile, they are taken to a web site where they are presented with a random image of a real Toynbee Tile. Not only would it be a cool bauble, it would also bring together a couple threads I’ve been thinking about – the almost unnoticed human extension via gadgets that’s happening ever more quickly and the slightly slower machine info embedding that’s rolling out here and there. The web site – mtoynbee.com – is up and running. The ‘m’ stands for mediated or meta or messed-up or whatever else you care to force fit. You can click on the picture of the tile to access the blog where I’m stashing more info – n.b. 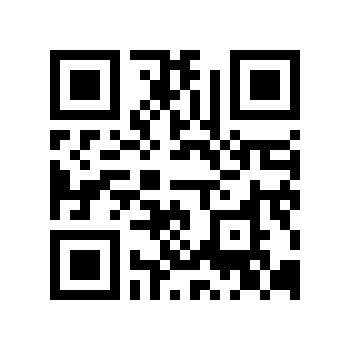 – the QR Code post is sticky (at least for now); it will stay on top and the most recent post will be directly below it. The current sub-project is adhesive testing; the QRCode Toynbee Tiles need to stay intact and well-aligned. We humans, with our great pattern recognition skills, can pull meaning out of a tile that’s pretty bunged up – bar code scanners are nowhere near as good. I’ll post little updates here, pointing over to the Mediated Toynbee blog, when we hit milestones. This entry was posted in funny, making things by dr.hypercube. Bookmark the permalink.